[Children & Teens (Age: 7 to 12 Yr) **120mm wide**] Rec Specs Maxx 20 Baseball [Black with orange] glasses: Want sports glasses that look and feel like regular glasses so your child would wear them? These Rec Specs sports glasses will do the trick. Cool looks coupled with confidence inspiring impact protection (Meets or exceeds ASTM F803), these glasses would be ideal for both indoor and outdoor sports. 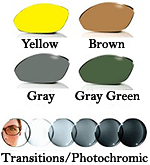 Optional prescription lenses made to your child's actual script are also available. Suitable for Baseball, Basketball*, Handball, Paddleball, Racquetball, Soccer, Squash, Tennis etc. Recommended for children & teens between the ages of 7 - 12 yr.
* Meets or exceeds the ASTM F803.03 standard for baseball for children 8 years old and younger at speeds of 40 MPH and below. Major League Baseball inspired team colors. Supple temples and bridge padding for comfort and fit. These goggles are great quality and came in a reasonable amount of time.